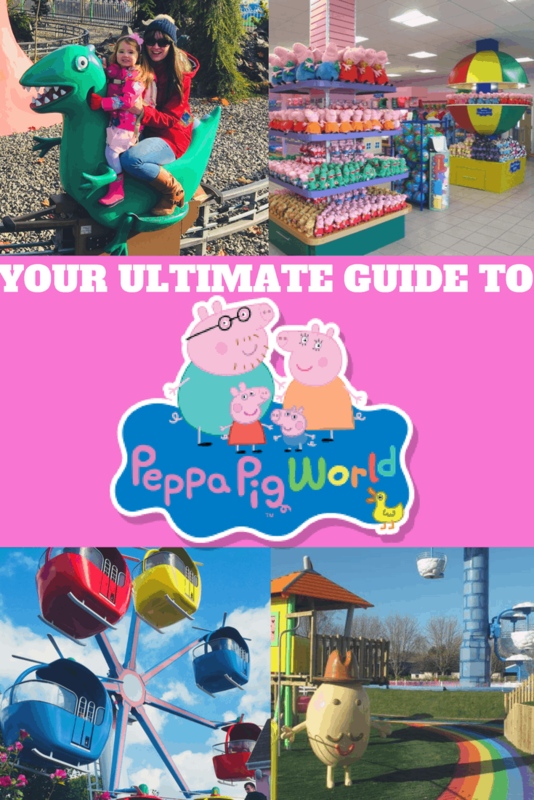 Hints, tips and tricks for making Peppa Pig World magical for your little piggies. 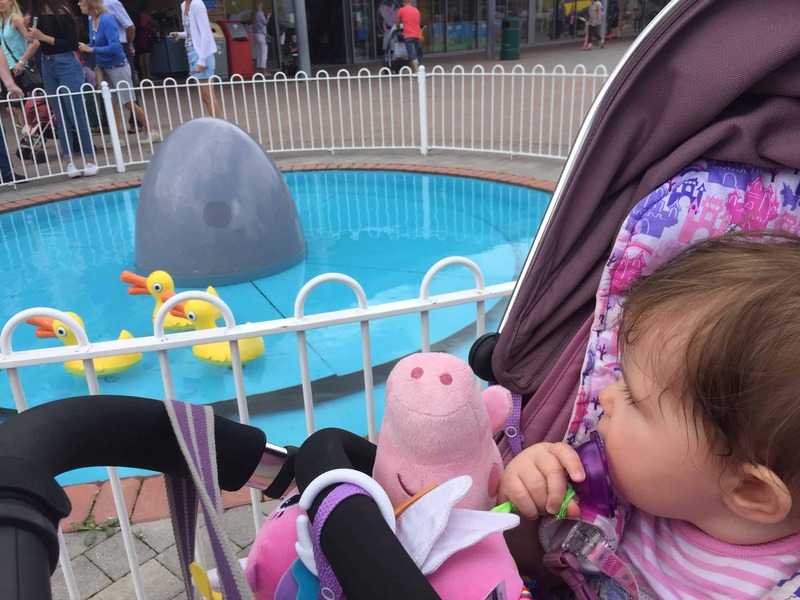 If you have a small child, chances are that they are a fan of Peppa Pig. Like most small children, my lot are obsessed. 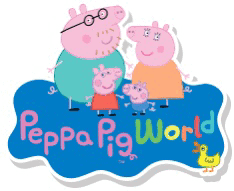 Naturally, they were desperate to go to Peppa Pig World. Our first trip was ok, the children enjoyed it, but we really didn’t maximise our day. 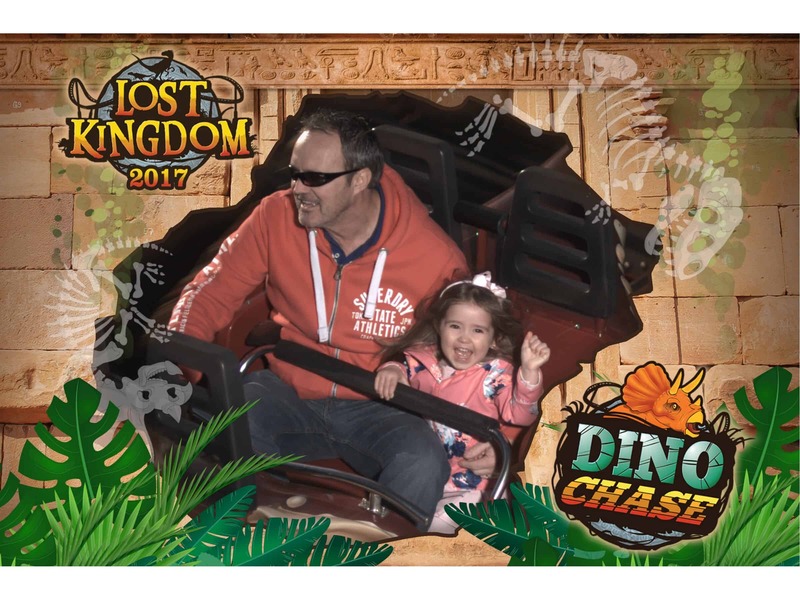 We didn’t manage all of the rides and I left thinking that we could have had more value for money had we planned it better. Since that first trip, back in 2015, we have been back quite a few times and have picked up some top tips for making the most of the day. 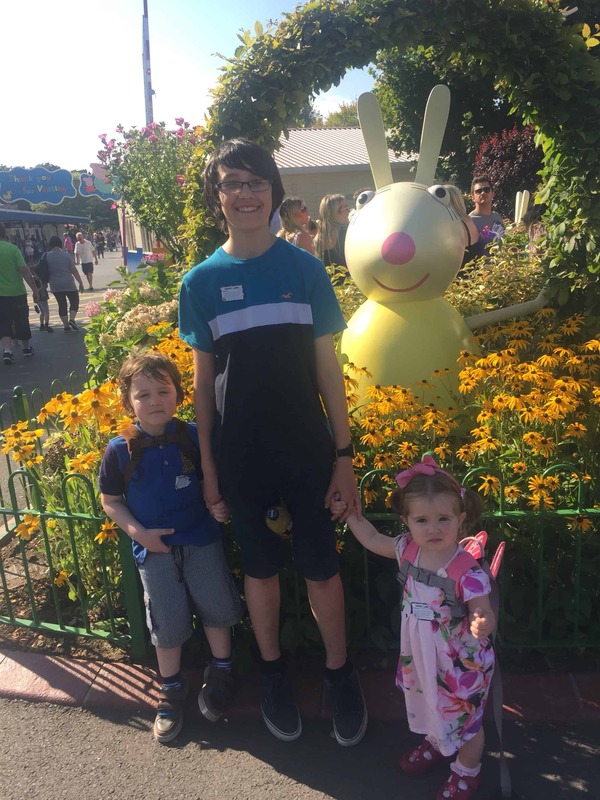 Read on for my top tips to help you make the most of your visit too. It is possible to buy tickets on the day, but you can benefit from savings by buying in advance. The tickets do not have to be used on a specific day, so even if life throws a spanner in the works on the day you were planning to go, you won’t have wasted your money. Check out their group ticket options before booking to check which is the cheapest way to get your family in. 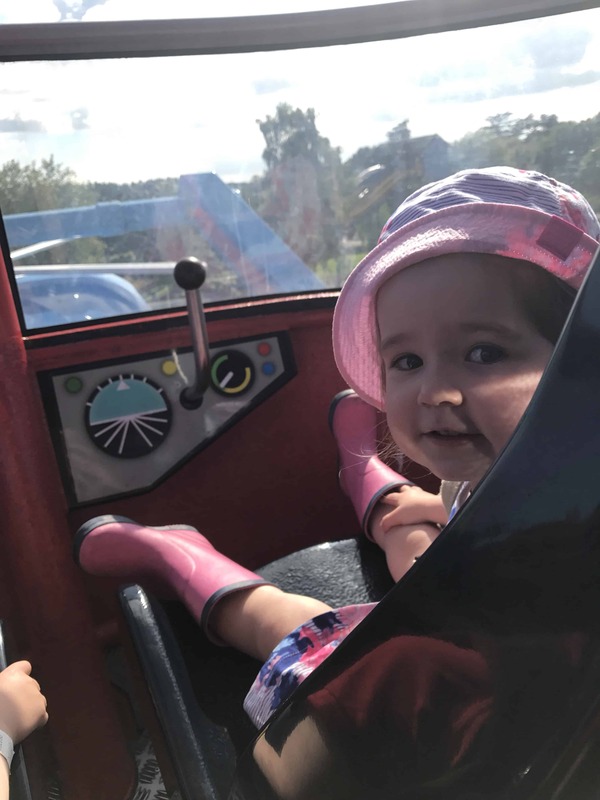 Don’t forget that children under 1 metre are free, but they will measure them with their shoes on, so check them before you go. If your children are not yet of school age, you may not be aware of when half term falls. It is defiantly worth checking out, as going during school holidays you will find that it is much busier. If your children are school age, consider going on an inset day if possible. Bare in mind that English half term may fall on a different week to areas such as Wales or Scotland, so it is worth checking before booking. If you do have to go during school holidays, aim for mid week and avoid bank holidays where possible, as these will be busier times. 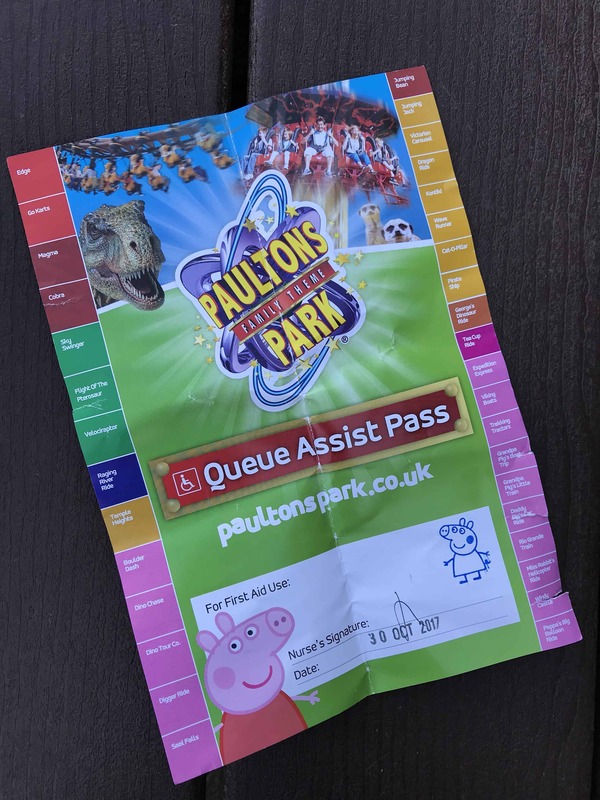 While Peppa Pig World tends to open at 10am (check opening times here for the specific day that you plan to go), the main gates of Paulton’s Park tend to open before that. We have generally gone through the main gates at 9:30, then got into the next queue to enter the attractions. This will mean that you can be one of the first on the rides. For those guests with disabilities or additional needs, such as ASD, Paulton’s Park run a queue assist system. This system means that eligible guests can go to the First Aid Centre with doctor’s proof of their condition, where they will be given a band and a queue assist sheet. 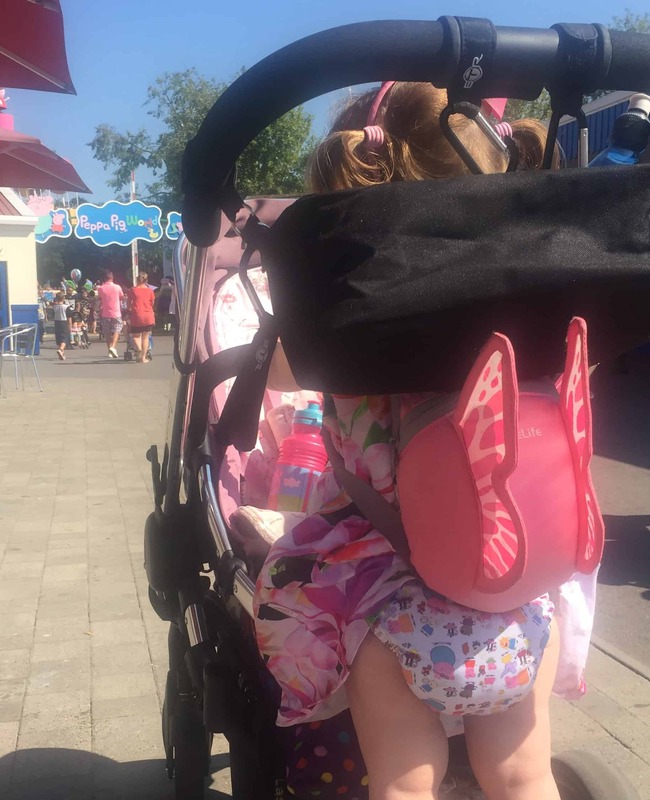 This will allow the person in question, plus a few other people (the number of extras depends upon the ride) to go to the exit of the ride and be allowed directly on without queuing. The queue assist can be used once per ride, then a rip will be made in your sheet, indicating that the pass has been used. For our 5 year old with ASD who really struggles with queues, this was an absolute life saver. Click here for more details of queue assist. 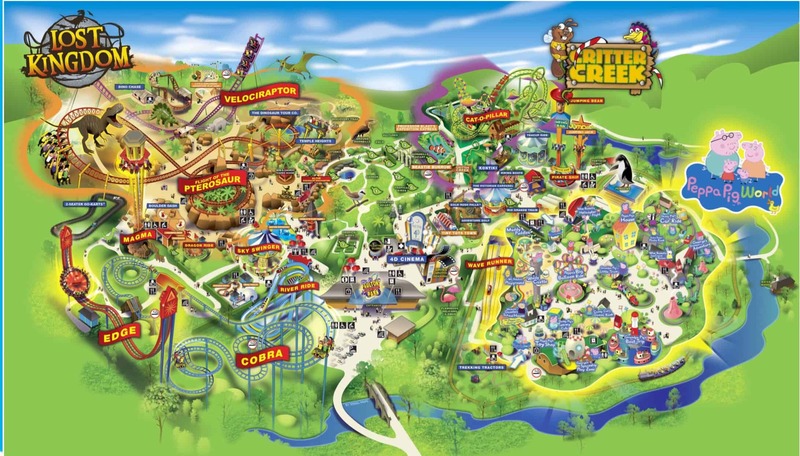 My advice would be, head to George’s Dinosaur Adventure, the ride over the furthest side of the park, first. As the gates open, eager visitors tend to flock to the rides nearest the entrance first. 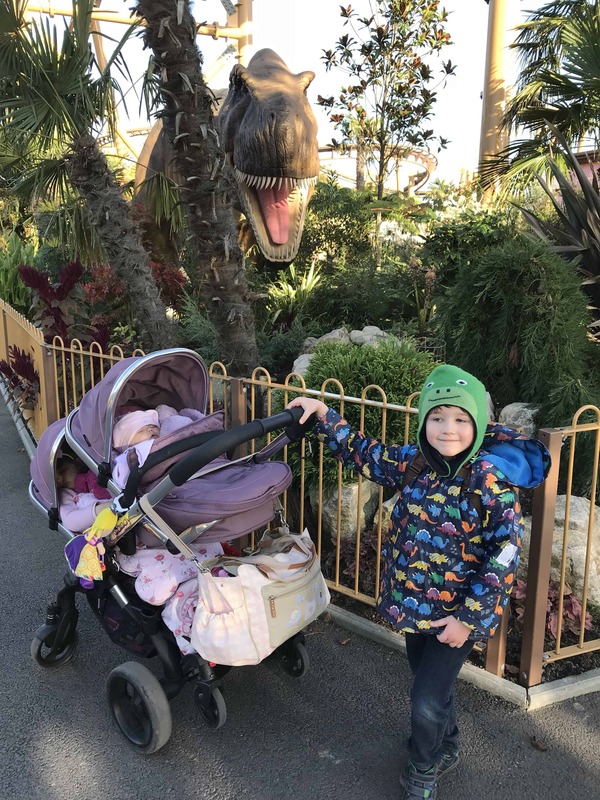 George’s Dinosaur ride is incredibly popular later in the day, but even without a queue assist pass, the queue shouldn’t be more than a few minutes long first thing in the morning. 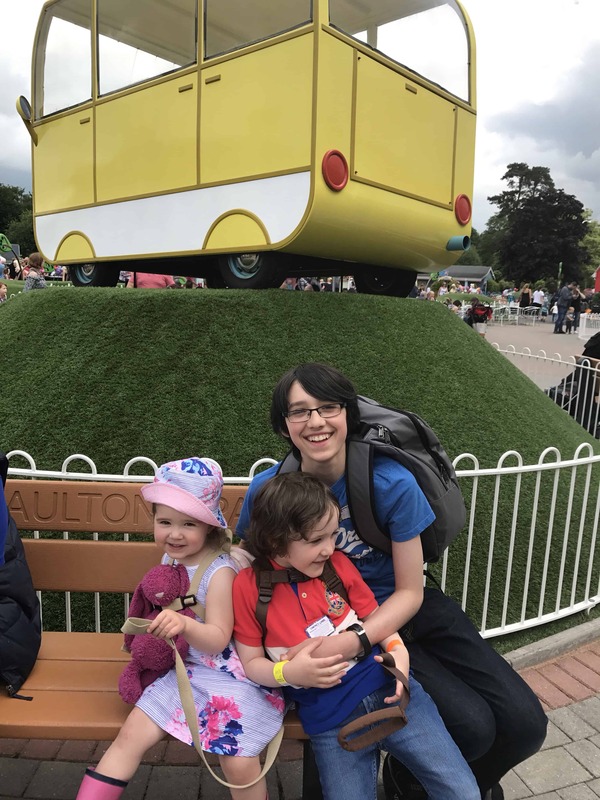 If you do have queue assist, only the eligible person can queue jump on this ride, (as the system seems to be that the person with the band plus the other people that will fit in the carriage of the ride can queue jump. 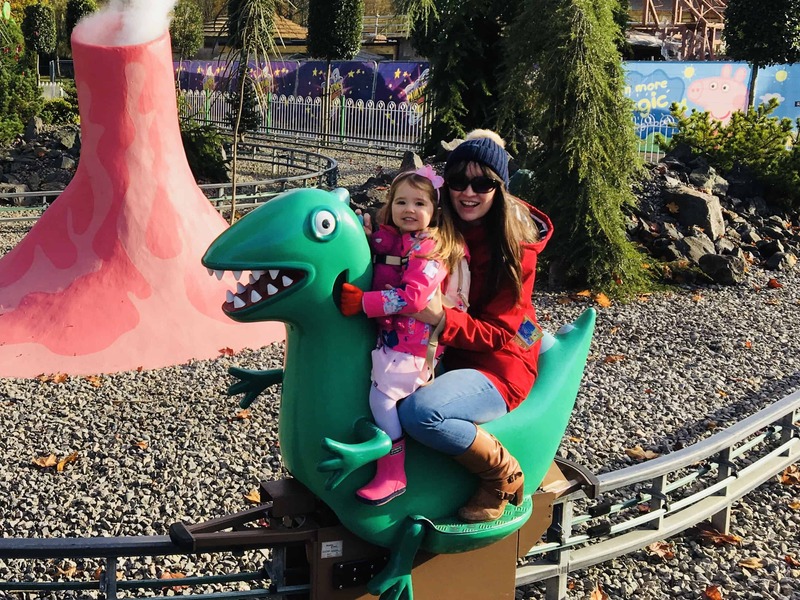 This ride is a solo or just one parent and one child per Dinosaur). 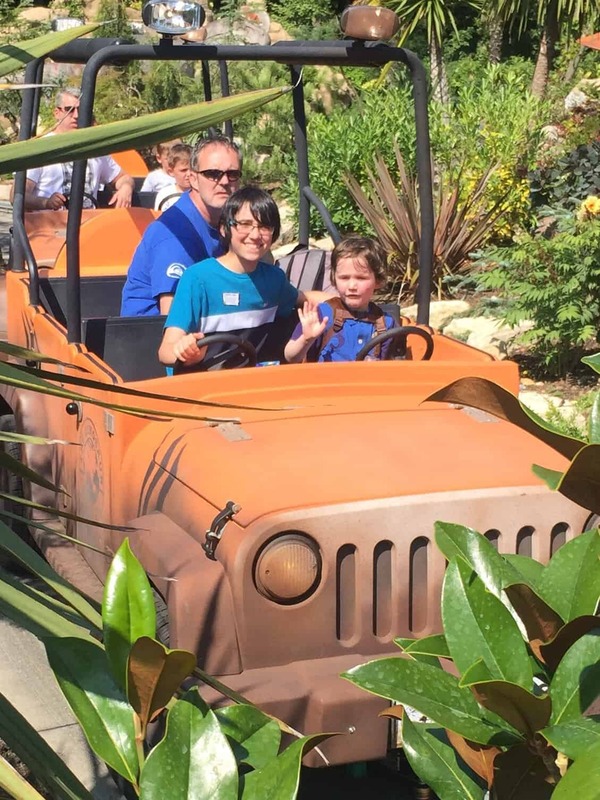 So with or without queue assist, starting with George’s Dinosaur Adventure will mean that all members of your party can ride with minimal queuing. 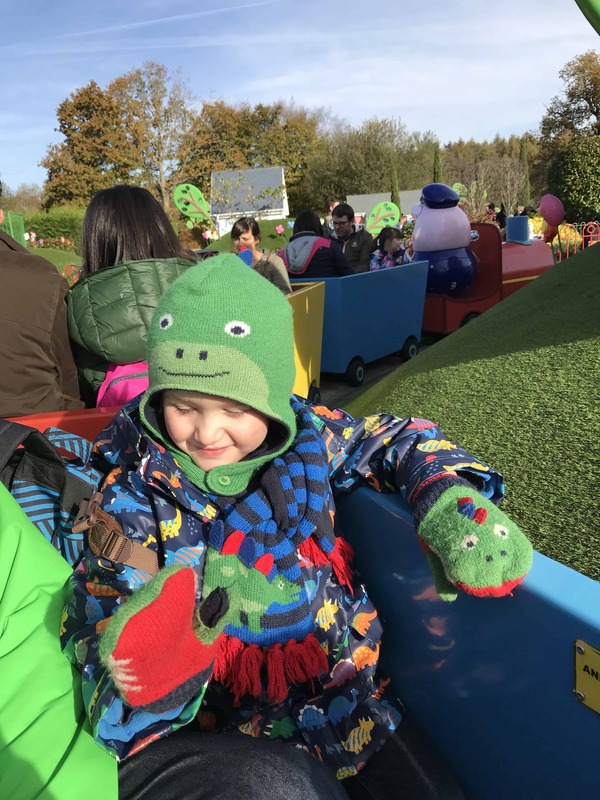 The ride takes you around Grandpa Pig’s garden where you will see lots of Peppa’s friends, then around a dinosaur volcano world, all while rocking along on Mr Dinosaur. Next to George’s Dinosaur Adventure is Daddy Pig’s Car Ride. 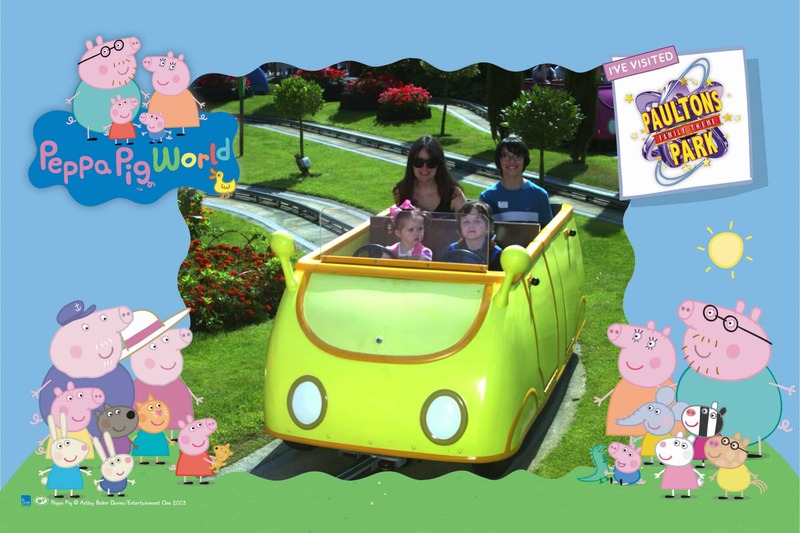 This ride allows 2 drivers and 2 passengers to take a drive around where you will see lots more of Peppa’s friends. In front of the entrance to Daddy Pig’s Car Ride you will find Grandpa Pig’s Train. 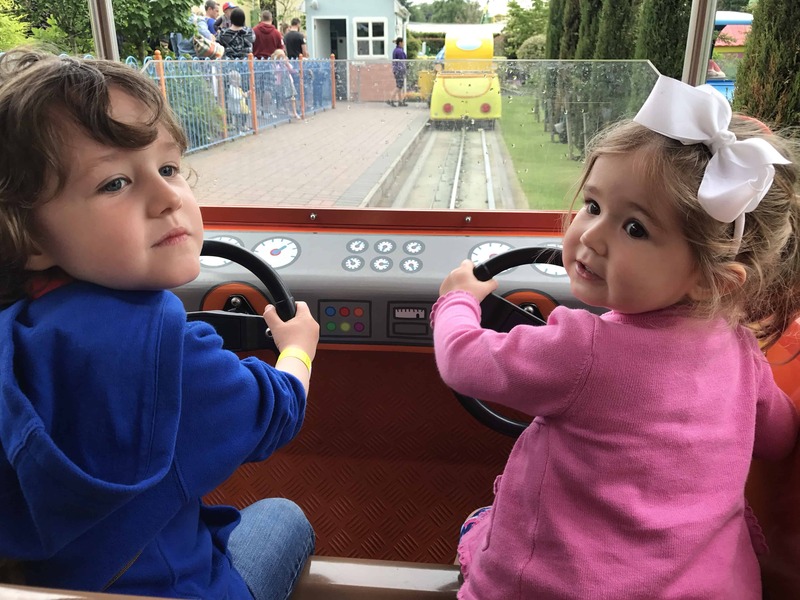 Your little ones will love taking a ride on “Gertrude” the train, which takes you twice around the track, I know mine did. Grandpa Pigs Boat Ride takes you on a wavy ride around Grammy Rabbit’s Lighthouse. 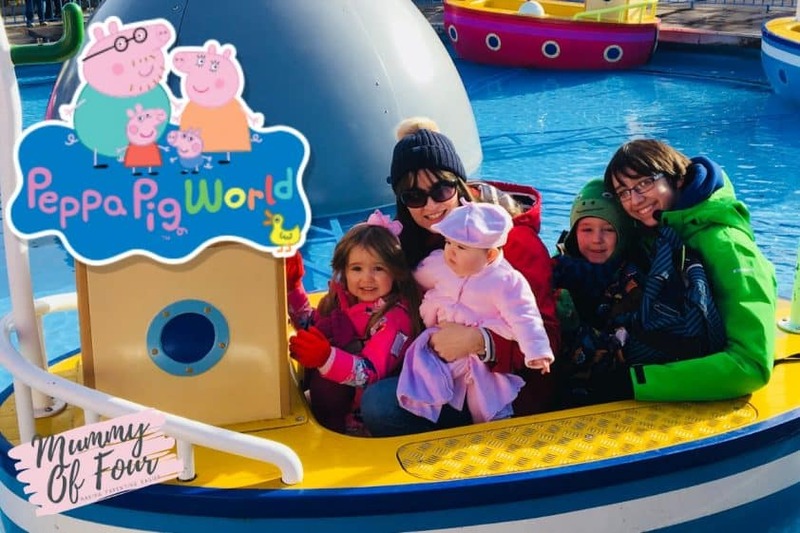 Peppa’s Balloon Ride is right in the centre of Peppa Pig World. 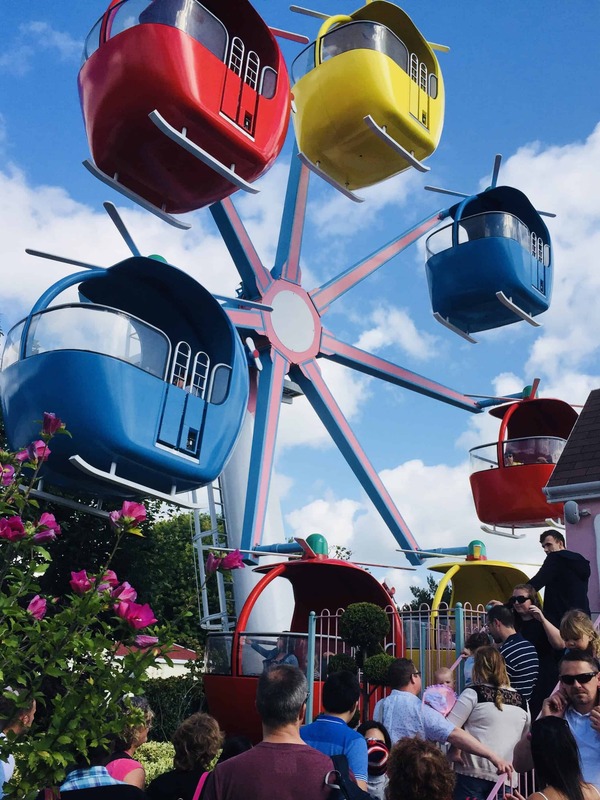 This lovely ride lets you soar up high and gives a great view of the park. 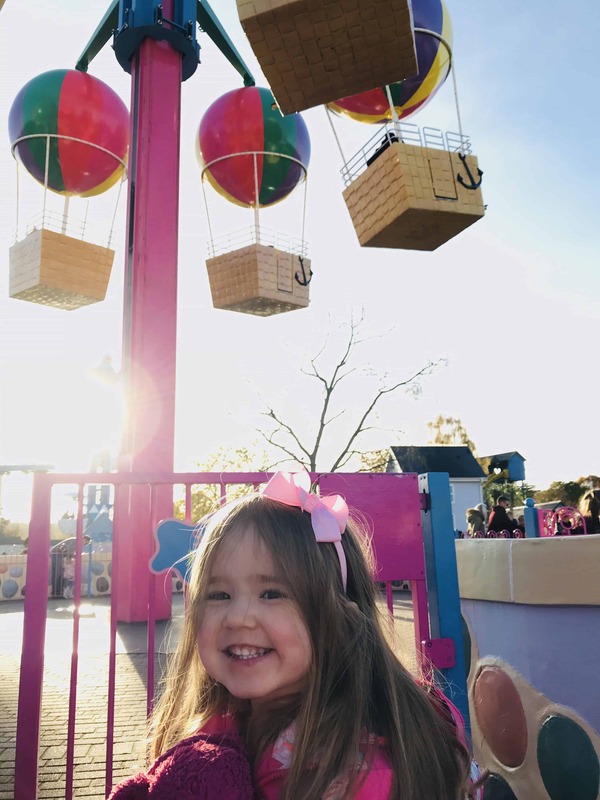 You have the option to spin the balloon if you like, making the ride a little more wild for your excited tot. 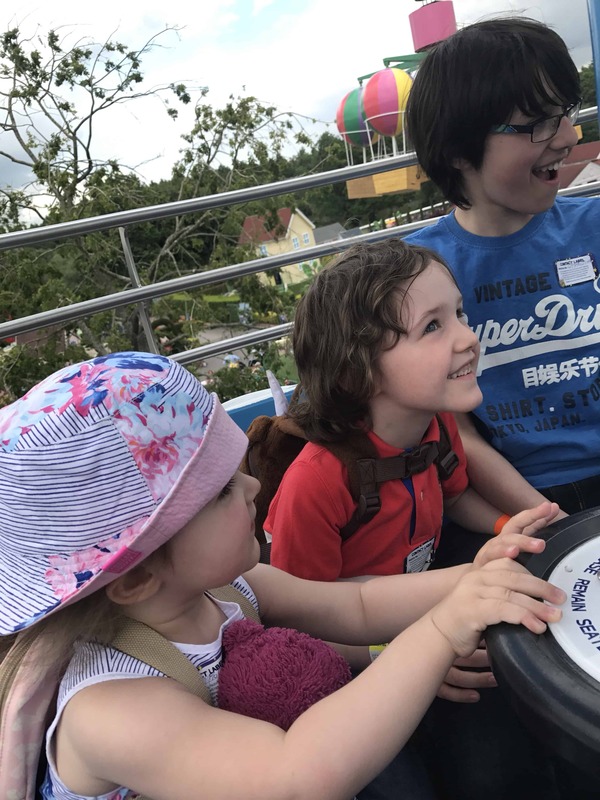 Windy Castle is another high in the sky ride where you have the option to spin the gondola and make the ride quite exciting, while enjoying the views of all of Peppa Pig World. In my experience, Miss Rabbit’s Helicopter Ride has the slowest queue. The ride takes a long time to load passengers, as each carriage has to stop separately. After the ride has completed it’s rotations, each carriage has to stop again to let everyone off. The first year we went, we did this ride first (mainly because it is next to the entrance). Even heading to the ride first, the queue was still long. My advice? Leave this one to last. If you run out of time to do all of the rides, you may as well miss out the one with the longest queue. 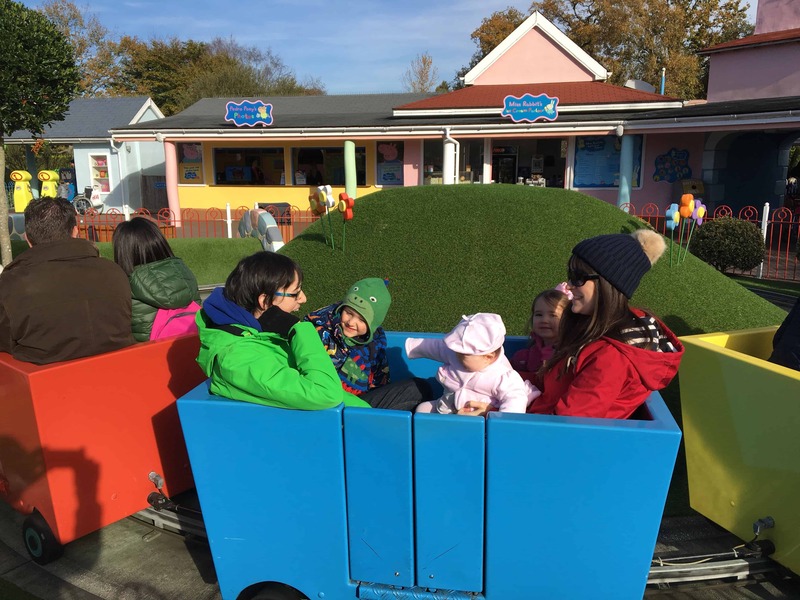 There are lots of non ride attractions in Peppa Pig World too. Once you have been on a few rides and the queues start to get longer, these are well worth checking out. 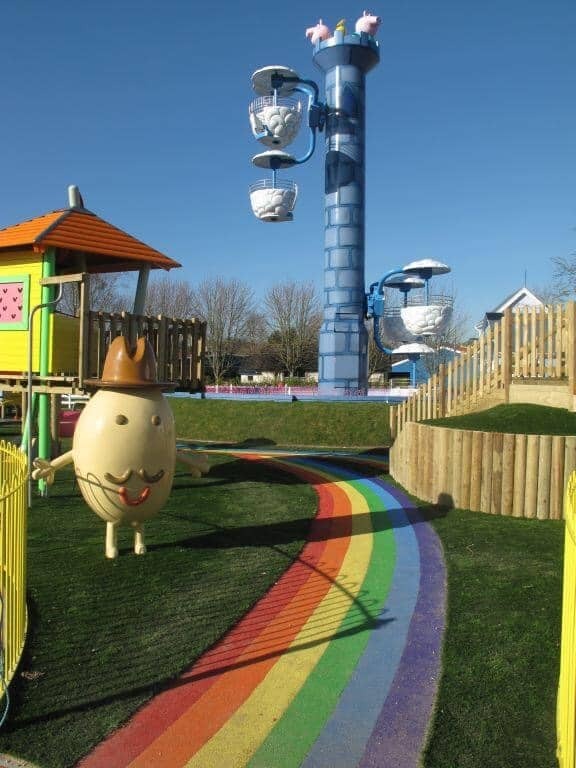 Mr Potato’s Playground is a great place for your little ones to run off some steam. 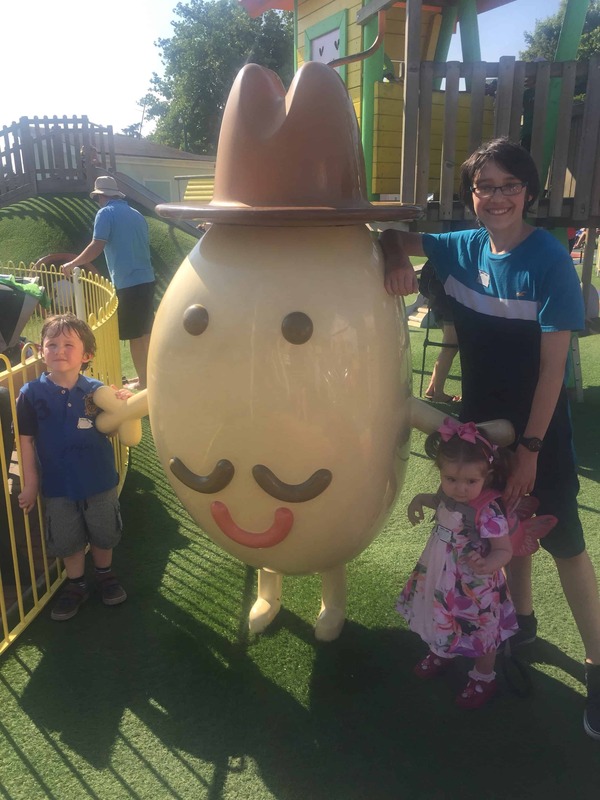 Don’t forget to get a picture with Mr Potato himself! 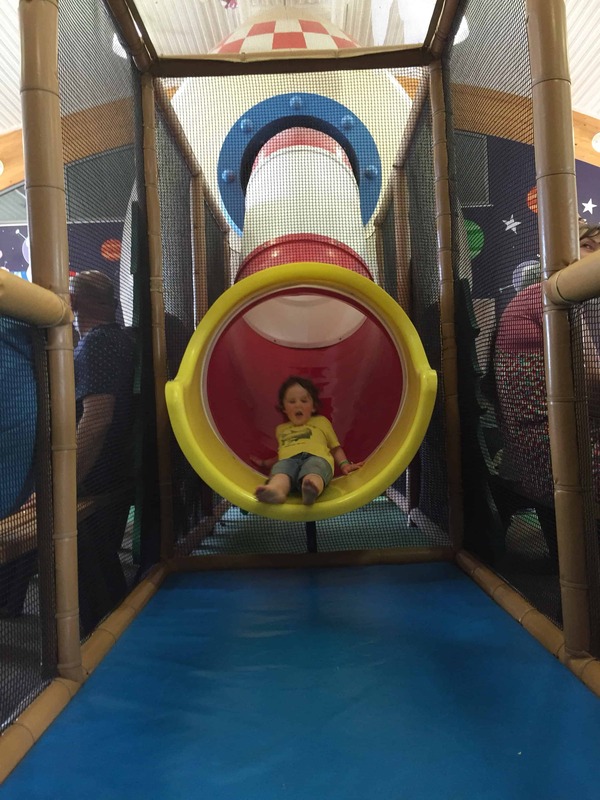 George’s Spaceship Playzone is an indoor soft play area, ideal for if the weather isn’t brilliant. 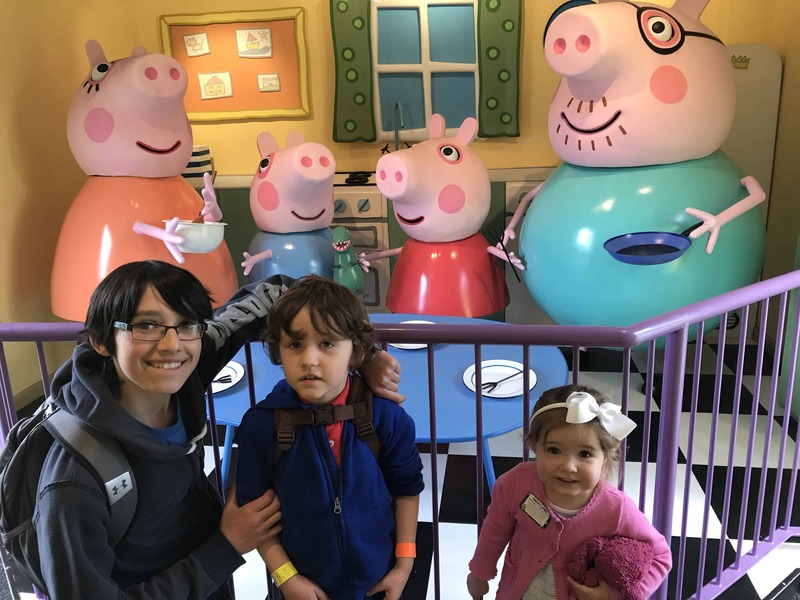 Peppa’s House is a walk through attraction where you can hear MummyPig, Daffy Pig, Peppa & George talk about making pancakes. There is sometimes a small queue for this, but it generally isn’t too long. 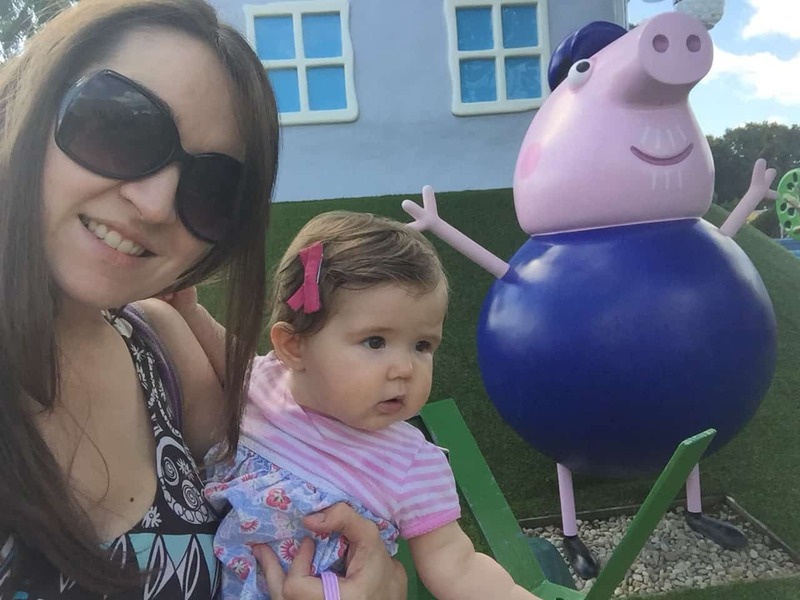 You can’t go into Grandpa Pig’s House, but don’t miss out on the selfie opportunity. 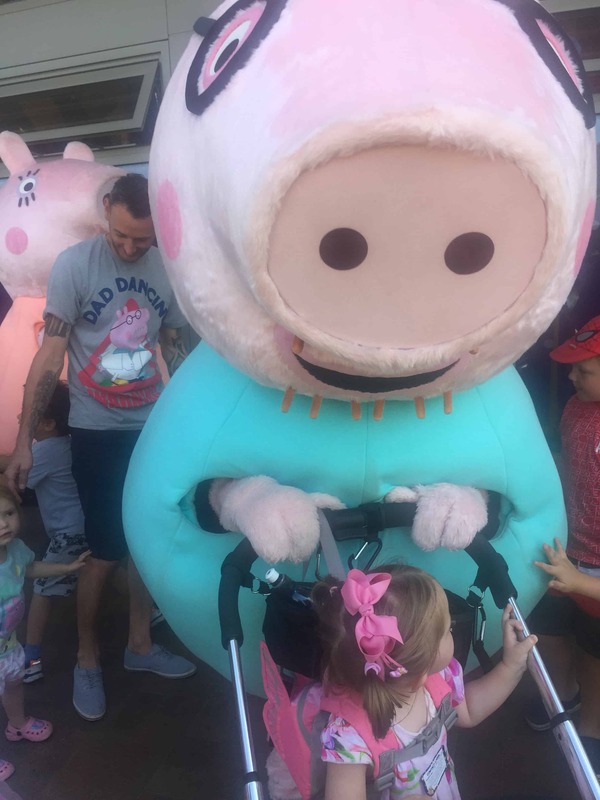 There are lots of Peppa’s friends dotted around the place, make sure you get a snap of all of them. 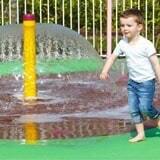 The muddy puddles area is a wet attraction where children run around in sprinklers. You will need swimwear / a change of clothes for this. Personally, I’d give it a miss due to the hassle of changing clothes and focus on the other rides. Sing with me – “We’re going on holiday in our camper van”. “The ducks always turn up when we have picnics”. The toy shop is a Peppa-tastic extravaganza. Your little one will want everything they sell. Lots of it can also be bought on Amazon, but look out for merchandise that is exclusive for the park. There is another, even bigger toy shop at the exit of Paulton’s. There are some Peppa Pig toys in that toy shop too, but not as much of a selection. 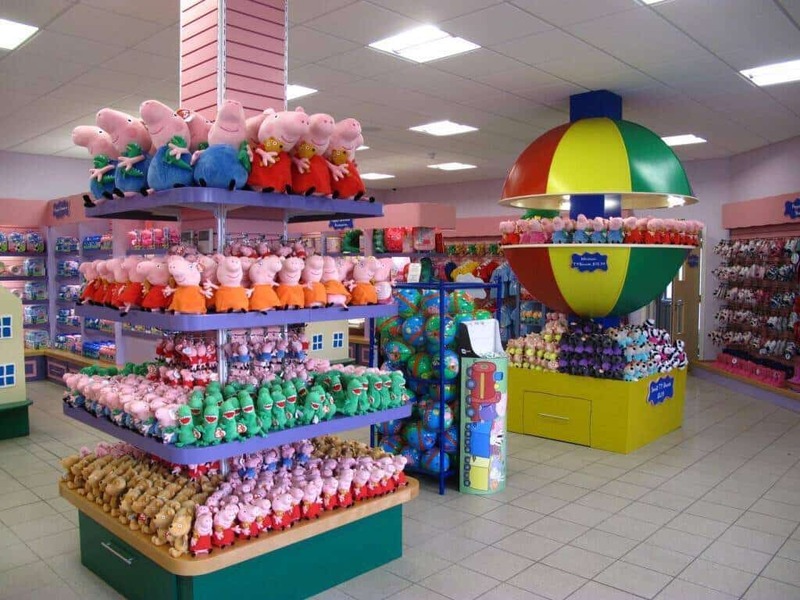 If your little piggies have their hearts set on something in particular, make sure you pick it up in Peppa’s Toy Shop. 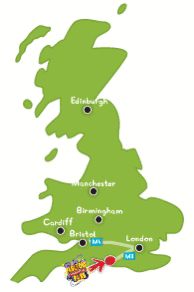 Of course, there is a lot more to Paulton’s than just Peppa Pig World. 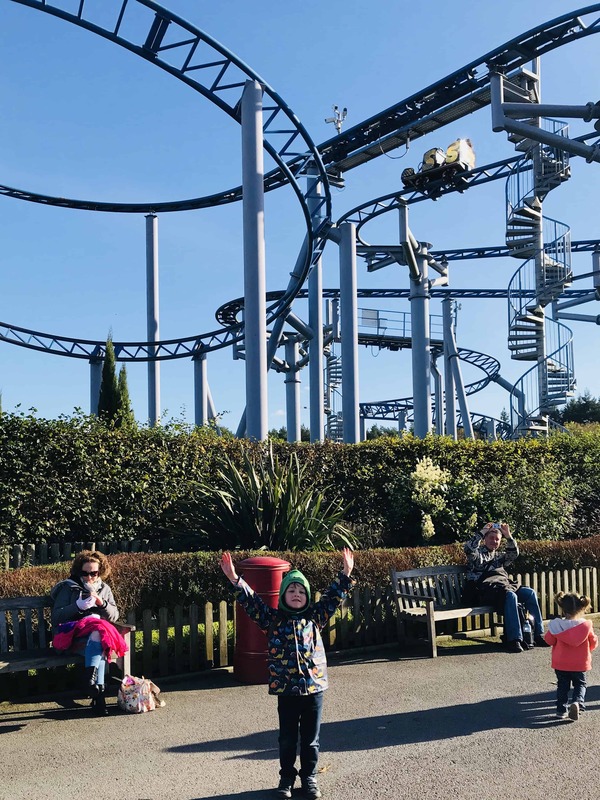 If you also have older children with you there are plenty of rollercoasters and thrill rides to excite them too. 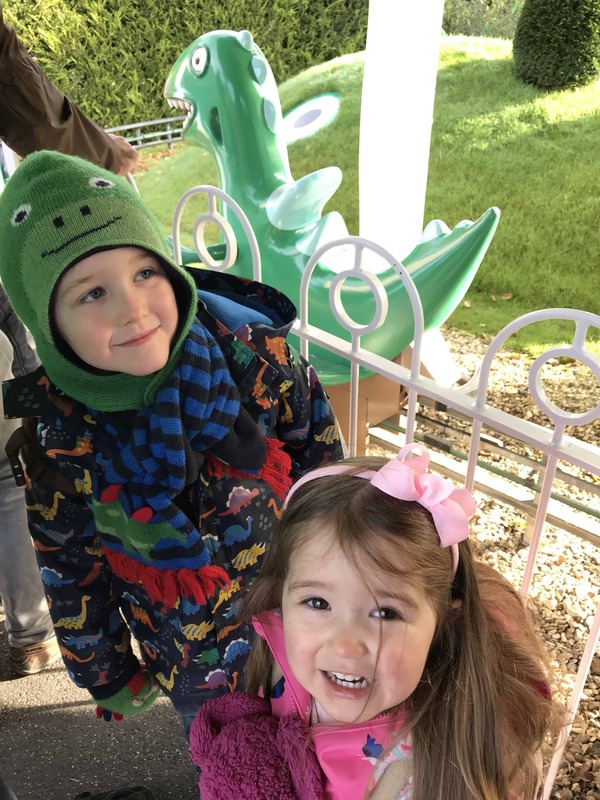 If you are visiting with small children who are still of a napping age and older children too, my advice would be to go to Peppa Pig World first. Next have some lunch, then settle your tiny ones in their pram for a nap, while your older ones enjoy the other more ambitious attractions. 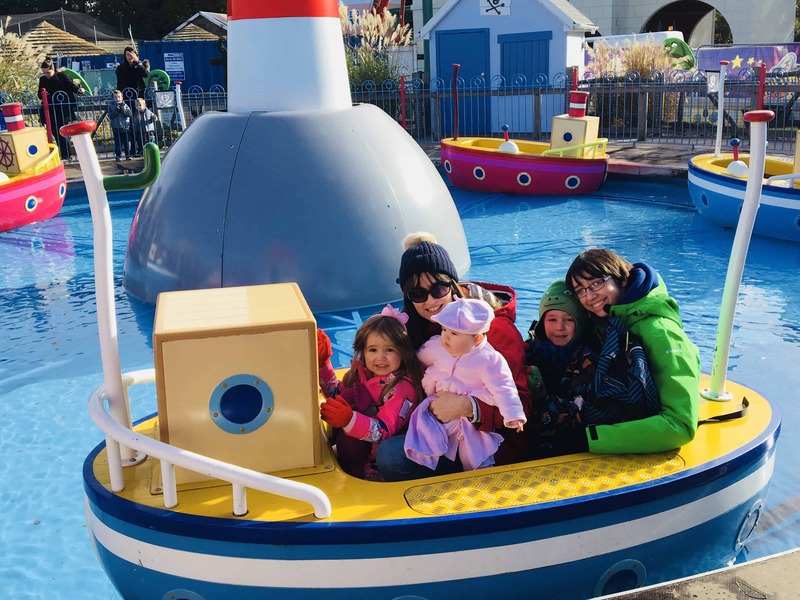 Once the little ones are awake, you can head back to Peppa Pig World to finish off the day. The Lost Kingdom is a new section added in 2016 and is a must for dinosaur lovers (so basically, all children). Look out for the “real” little baby dinosaurs that you can stroke. This one was so realistic that my son thought that he had better wash his hands afterwards, as I always make him wash his hands after stroking animals. 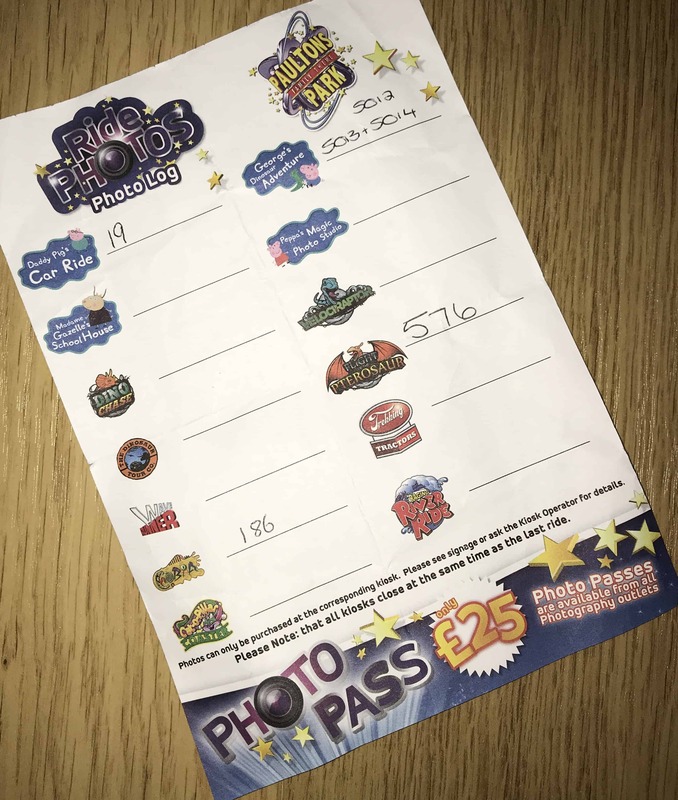 We bought a “photo pass” which gets you 4 photos from rides around the park. It’s a good idea to write down the numbers of your photos, then you can select which ones you would like at the end of the day. This means that you know which photos you like best and avoids having to carry them around and potentially squash them. Bear in mind that you will have to go back to the kiosk of the ride where the photo was taken in order to collect your photo. 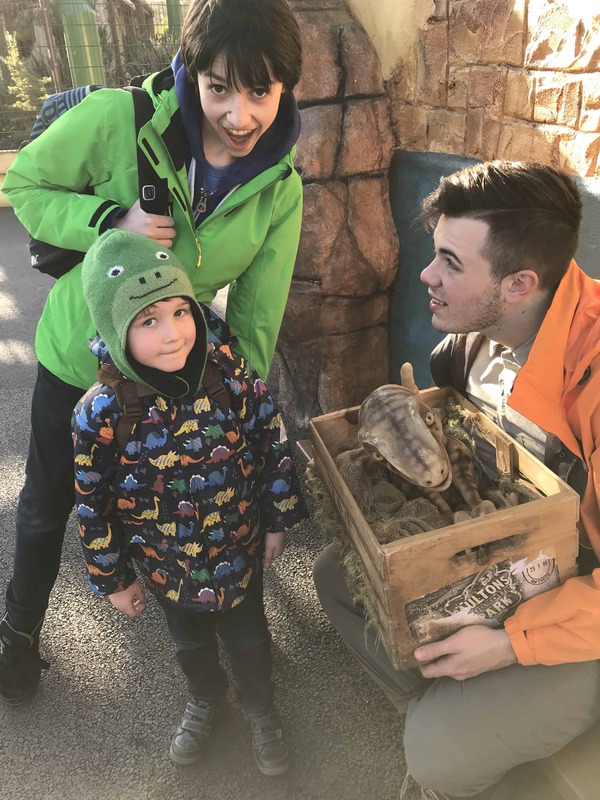 When you arrive at the park, ask what times that you will be able to “meet the characters” as these times change from season to season. 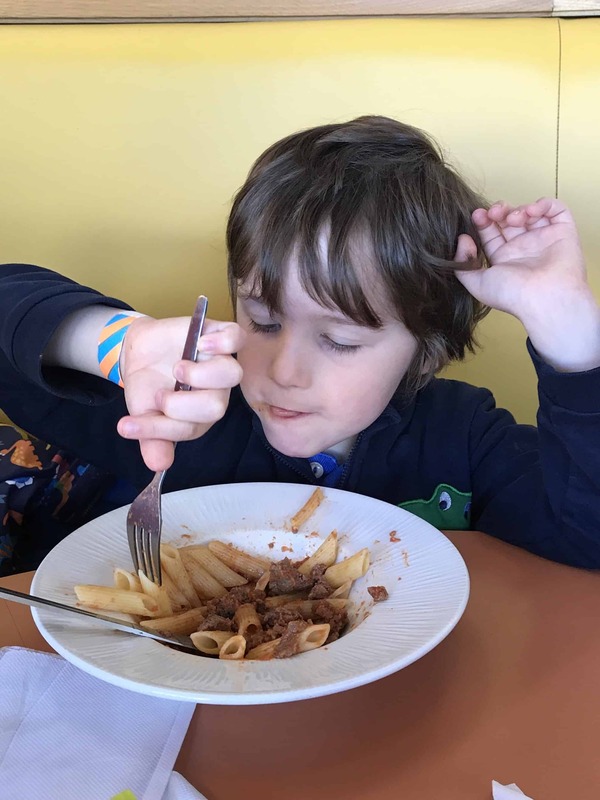 There are lots of places to grab snacks dotted all around the park, but we found the best place for quality, choice and value was the Wild Forest Restaurant near the entrance. 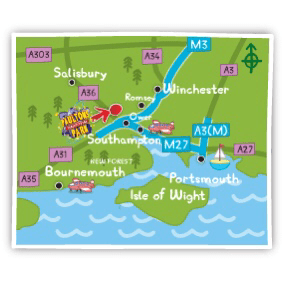 Click here to learn more about food and drink at Paultons. Make sure that you agree a designated meeting place with other members of your party in case you get separated. We found that phone signal on several networks was patchy, so you can’t necessarily rely on phones to find each other. The “Lost Child” centre is in the first aid centre near the entrance, so I would suggest that this would be a good designated meeting place. The First Aid Centre is also the place to get your “lost child” stickers, where you can write your number on the sticker and attach it to your child in case of emergency. If you are a rollercoaster fan yourself but have tots in tow, you can take advantage of the “tot swap” on height restricted rides. Most of your parry queue as normal, request a tot swap ticket, then the remaining people attend the exit of the ride and go straight on without queueing. Make sure you download the Paulton’s Park App here before visiting. 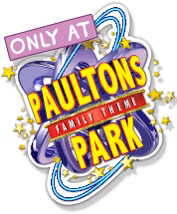 For more information, visit the Paulton’s Park Website. 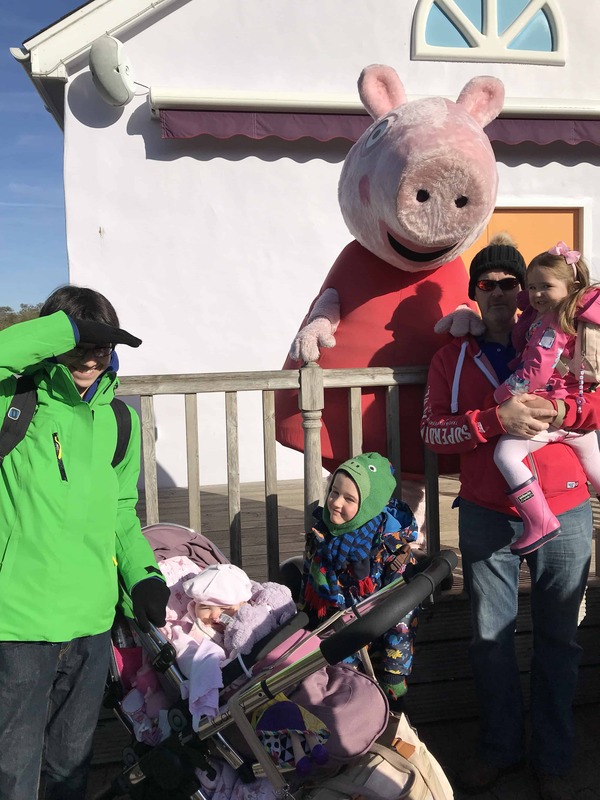 Have you been to Peppa Pig World at Paulton’s? Do you have any advice for making your visit a success? Brilliant tips and lovely photos thank you 😃 we’re heading here next year so will make use of these. oh my son would love this, he loves peppa pig! Shame they have nothing like this over here in Australia! Next time we are in the UK, i’ll be sure to make a visit there! It looks fabulous. I had not heard about this before we left the UK for australia, otherwise i would have been sure to have gone! Great pictures, and really good descriptions of everything!